Yup. Oreo ice cream cake to be exact. Okay guys, so there's some back story with this one. I have ALWAYS wanted to make my own ice cream cake at home. And believe it or not, I'm not a big cake eater but there's always room for ice cream. Soooo...for a hot minute, I worked at a fast food place famous for their ice cream cakes just for the hands on ice creamy experience. Seeing as we were in the middle of a heat wave and I can get down with an Oreo ice cream shake. I decided to make my own couture Oreo ice cream cake. I've never actually had an Oreo ice cream cake before, so the excitement was REAL. I made a couple small time changes that you'll see below. So, for best results, please use this recipe. 1. Place the spring form pan on the cake board and cover the bottom of the board with whole Oreo cookies. In a bowl, crush 10 cookies and stir in a tablespoon of the chocolate syrup. Use the mixture to fill in the spaces OR fill the entire bottom with the Oreo crumbs only. 2. Optional- Cover the bottom of the 6" cake pan with plastic wrap and place inside of the spring form pan. Gather up a little strength and press down- compacting the cookie crumbs into a crust. The chocolate syrup will help it set. 3. In a large bowl, crush a few Oreo cookies, then combine with about 2 cups of softened ice cream. Carefully spoon the ice cream into the spring form pan. 4. Using a small spatula occasionally dipped in hot water will allow you to easily spread the ice cream evenly without pulling up the crust. This should be enough ice cream to fill half of the pan. 5. In the video I said to place the cake in the freezer for about 15 minutes. HA!!! Let's make that one hour. Once the ice cream is out of the freezer, make a cookie center using cookie crumbs or whole pieces. 6. Lastly, add the rest of the vanilla ice cream. Yes, this took one whole container of ice cream. Using the same spatula method as before, carefully dip the spatula in hot water to push the ice cream in place without bringing up cookies. Level the cake by dragging a spatula off the top and allow the cake to freeze for at least 2 hours. I prefer over night just to be safe. 7. Now it's time to release the cake from its' metal barrier. Give the pan a quick warm hug with a hot towel and it should release with no problem. Use a bench scraper to straighten the sides and fill in gaps along the sides. Then place in the freezer for 30 minutes. 8. Finally, the fun part. Drizzle the edge of the cake with the hardening chocolate syrup and allow it drip down the sides. You can also drizzle zig-zags onto the top of the cake for some extra glamour. 9. 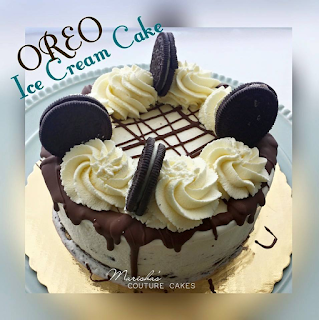 Finish the cake by piping swirls of delicious stabilized whipped cream (recipe) and topping with a few of your Oreo's. Do you hear the angels singing? Because this cake is heavenly. There are a lot of steps but have fun with it and get creative. I was two freezer moments away from adding some chopped snickers to the center. I hope that you all enjoy the video on YouTube and if you have any questions, feel free to ask!